In the 2013 Light Rail Environmental Impact Statement the stop in Alison Road was directly outside Royal Randwick racecourse. In the 2014 modification the alignment was changed, at the request of the Australian Turf Club, and moved to the Centennial Park side requiring racecourse patrons to cross 6 lanes of traffic. This realignment impacted the existing cycle and pedestrian path and large trees – including old growth figs – that provided shelter and resulted in major and expensive works for Kensington Pond. Around Christmas 2015 the trees along Alison Road and others along Anzac Parade were removed. In early 2017 Transport for NSW released a draft report recommending names for Light Rail stops. Unsurprisingly, one of the recommendations was to name the stop outside Centennial Park – Centennial Park. 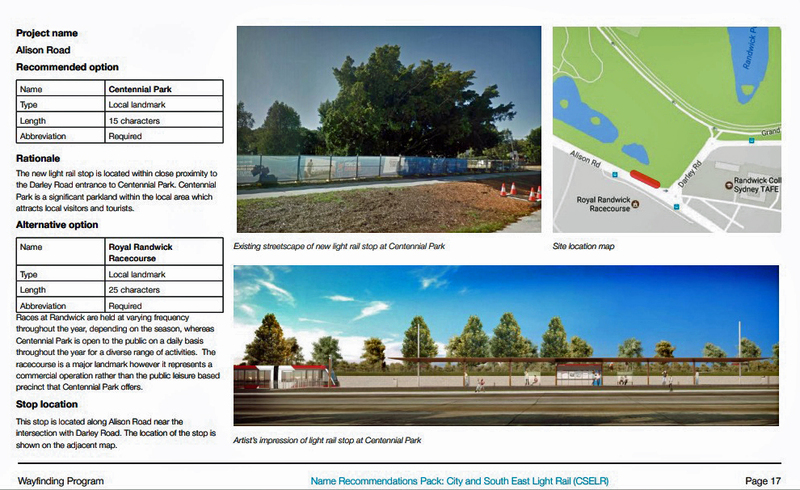 They also listed Royal Randwick but pointed out reasons why Centennial Park was favoured including popularity of the park, the alignment and the commercial name and activities of Royal Randwick. Randwick citizens, through Randwick Council, were canvassed and voted 2:1 in an online survey for Centennial Park over Royal Randwick. Council however recommended that both names go forward to Transport for NSW. The Department’s final report to the Geographical Names Board recommended Royal Randwick. This report was finalised after the Transport Minister, Andrew Constance, came out in favour of Royal Randwick. The Geographical Names Board took public submissions on all the recommended names late 2017 and earlier this month recommended Centennial Park (along with the other stop names) to Transport for NSW. 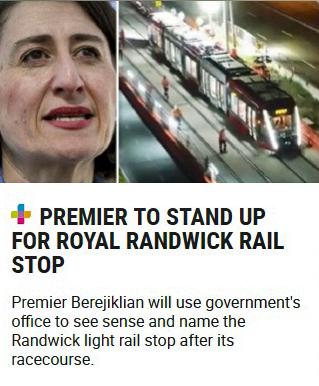 On Wednesday the Premier was asked about this and said the Government intended to call the stop, Royal Randwick, and that she wasn’t aware the Geographical Names Board had a differing view. Early yesterday in an interview with Ray Hadley she confirmed that the Government preference for Royal Randwick would prevail. This is clearly another example of where the Premier does not respect independent expert advice and the public consultation process. Chris Smith of 2GB was adamant in an interview with Narelle Underwood, the Government Surveyor and Chair of the Geographical Names Board, that he favoured Royal Randwick. According to Smith, the Light Rail was built to take patrons to Royal Randwick not Centennial Park. The fact that Centennial Park records over 10 million visits over 365 days of the year compared to a significantly smaller number on relatively few days for the racecourse is of no consequence for Jones and neither are the Geographical Names Board Guidelines which are clear on avoiding commercial names.